In England and throughout the UK venues for staging banquets are becoming more popular. These venues can vary in location from city centre venues to historic castles and country houses. Whatever the occasion for the celebration, these banquet venues will usually offer as much as possible by way of historic atmosphere. 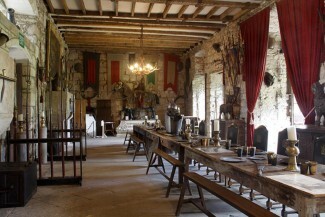 They may be in a location which was important in the medieval era, they will certainly have medieval-style food and music organised for the guests and they will sometimes even encourage you to come dressed in costume. Everyone involved in the running of a venue that stages this kind of celebration has to work very hard to create just the right atmosphere. The result of that commitment speaks for iself – an increasing popularity year on year, especially in the UK. All the signs are that banqueting will continue to be enjoyed for a long time to come. Roman style banquets with Ancient Roman cuisine, Roman music and entertainment. To be honest the list goes on quite extensively! Venues which opt to stage medieval-themed banquets are, however, amongst the most popular according to the research we have done. It’s an interesting point and begs the question why this is so. Perhaps it is the sheer romanticism of the idea of knights in shining armour and their ladies at court or the legends still loved today such as the legend of Robin Hood and Maid Marion whose story was set in medieval England during the reign of King Richard I (Richard Lionheart) and his treacherous brother Prince John.